Alre AFHM series manufacturer – Alre-IT Regeltechnik GmbH. 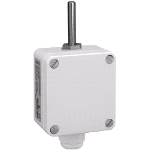 It is designed for temperature monitoring in outdoors, wet rooms, cold storage, green houses and industrial fields. The transmitter is specially protected against influence of dust and humidity.